One of my favorite sandwiches is a true Jewish New York pastrami. Unfortunately where I’m from you just can’t find anything that is even close. So I make my own. The cut of meat most Jewish delis use is the beef navel. It has a lot of fat layers just like bacon that make it so perfect for pastrami. It is a difficult cut to find for the average person. A reasonable substitute is the flat portion of the beef brisket. It has a nice fat cap but not a lot of fat layered. Some people choose to use the point portion of the brisket. It has a lot of fat but is marbled fat versus layered fat. I prefer the flat cut but it’s up to your own personal preference. This recipe works with either. A common error some home curers make is to buy a store bought corned beef that is ready to cook. They press the pastrami seasonings onto the corned beef and smoke it. They eliminate the 5 days minimum curing time needed to cure the brisket. The problem with that approach is that your pastrami is going to taste like corned beef, not pastrami. A dominant flavor in corned beef is pickling spice. You can’t get rid of that flavor by soaking and smoking. So if you are going to make pastrami, don’t take shortcuts. You can buy a flat cut brisket at most supermarkets. It should be about 8 lbs. Trim the fat cap down to about 1/4 inch. The fat is important but to much requires that you trim the fat cap after you smoke it and there goes a lot of flavor. Prepare your curing brine. 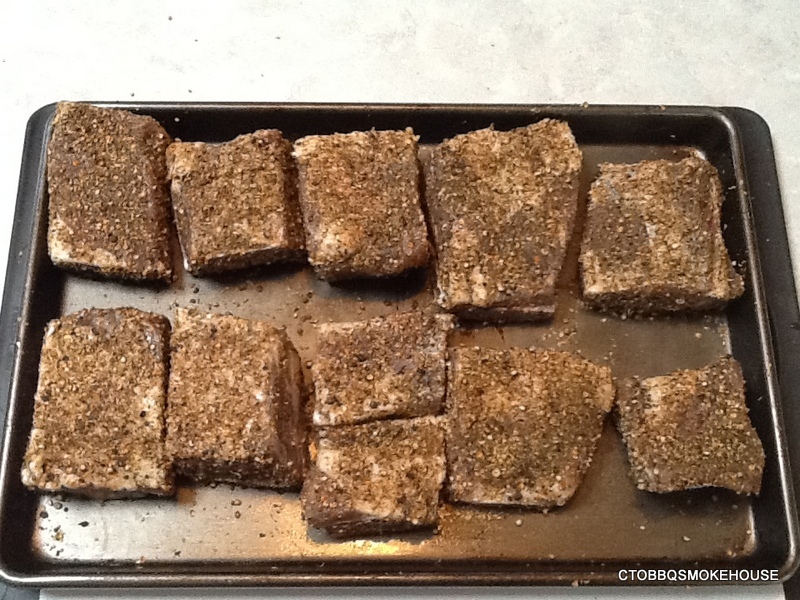 Inject the brisket with curing brine in 6-8 places to cut down on the curing time. Place in a food grade plastic bag and pour in the rest of the brine. Seal bag removing all the air and seal. Place in the fridge and let cure 5 days turning over once a day. 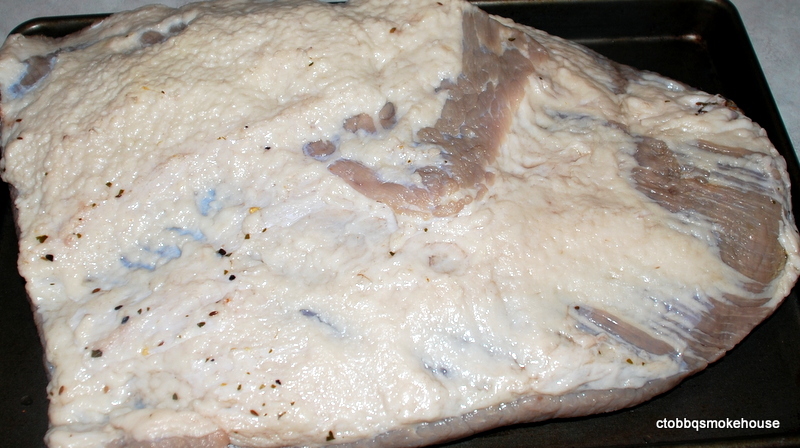 Remove brisket from brine and rinse. In a small cooler add cold water and allow brisket to soak 4 hours changing the water every hour. This removes excess salt and if you skip this step you will have pastrami that is so salty you will have a hard time eating it. Remove brisket from soaking water and pat dry with paper towels. It’s time to apply your curing spices. Use it all. Press it on all sides firmly. Place back in a food grade plastic bag and remove as much air as possible. Place a cutting board on top of the plastic bag with a cast iron or other heavy object on top. Place bag in the fridge and allow to cure at least 48 hours. I let it cure 4 days because I like the spices to infuse as much flavor as possible, and since the brisket has been preserved with instacure #1 you don’t have to worry about spoilage. 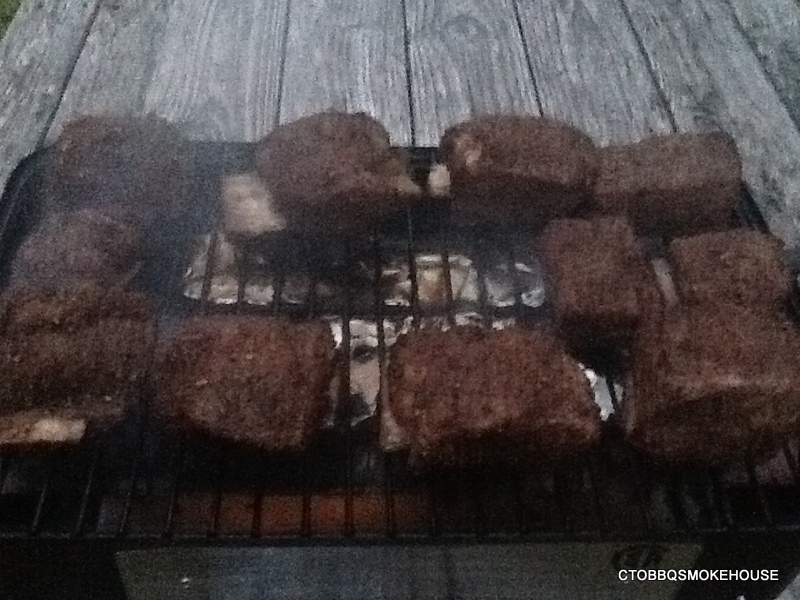 Place brisket in the smoker on an oiled rack and smoke @ 250 degrees for 6 hours. After 6 hours transfer brisket to a baking sheet with a rack and pour about 1/2 inch of hot water in the baking sheet. Cover brisket and baking sheet with heavy duty foil and place back in smoker or in an oven heated to 250 degrees for an additional 3 hours. Remove from heat source and allow to rest for at least 30 minutes, covered. It takes some serious time to prepare this pastrami so I would suggest that if you have the refrigerator space, do two briskets. 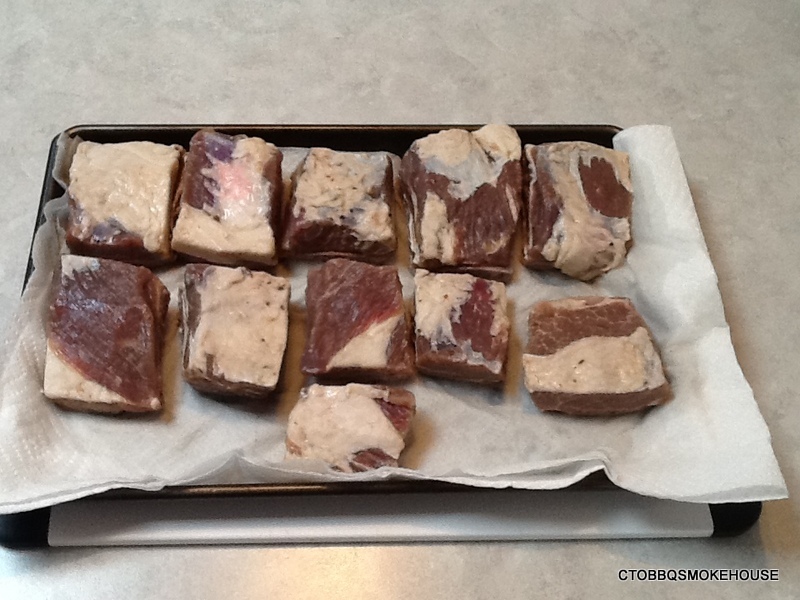 Once done, you can cut each brisket into several pieces (don’t cut in slices) vacuum pack and freeze for up to 90 days. You’re going to think you went to pastrami heaven, I guarantee! Place coriander seeds, yellow mustard seeds in a spice grinder and pulse just until seeds are crushed. Mix in the rest of the spices. 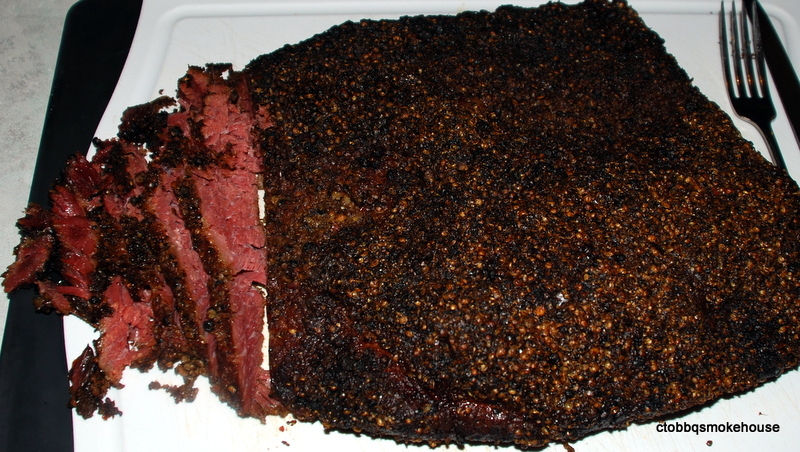 This entry was posted in Beef Brisket, Pastrami, Smoked and tagged Pastrami. This is a awesome recipe. I plan to use it the next time I cure a brisket into pastrami. In a large mixing bowl, combine the water, kosher salt, pink salt, and brown sugar and stir until the salt and sugar crystals have dissolved. Place ribs in large Ziplock bag. Allow to marinate 48 hours turning bag to mix brine twice a day. Take ribs out of the brine and rinse off any spice left on them. Pat dry with paper towels. 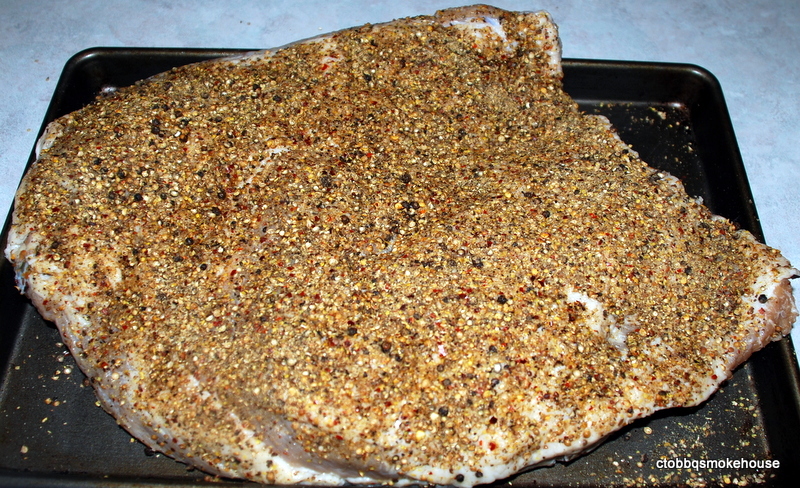 Now make the pastrami rub. 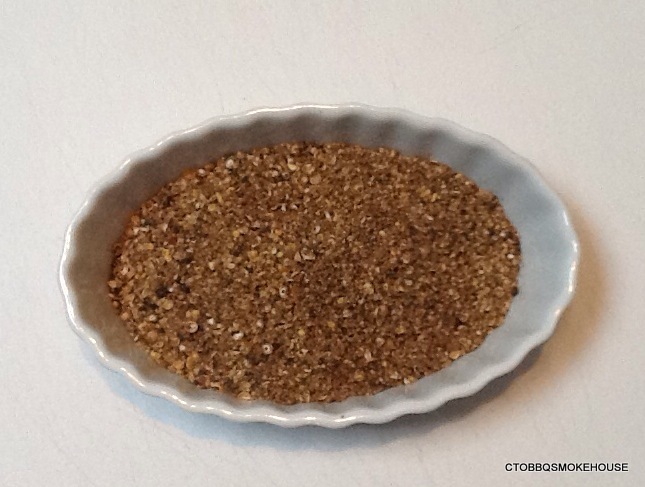 Put coriander, black pepper, mustard seed, and red pepper flakes into a spice grinder and coarse grind them. Stir in the garlic and mix well. Press spice into the meaty sides of the ribs, tops and sides. Don’t bother with the bone side. Place into a ziplock bag, remove as much air as possible and then place a weight on the ribs for 4 hours. Place ribs on a grill with smoke or a 375 degree smoker for 45 minutes. Remove and place ribs on a baking sheet bone side down. 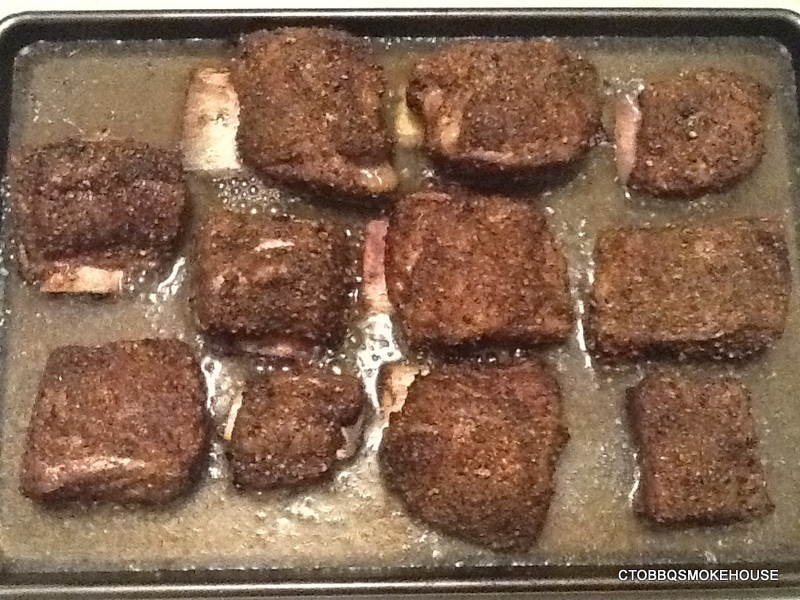 Pour ginger ale into the bottom of the baking sheet and up to the middle part of the bones on the ribs. Cover tightly with heavy duty foil and put into an 325 degree oven for 2 hours. Remove ribs from the baking sheet and place on a serving platter. Serve with cole slaw and garlic bread. 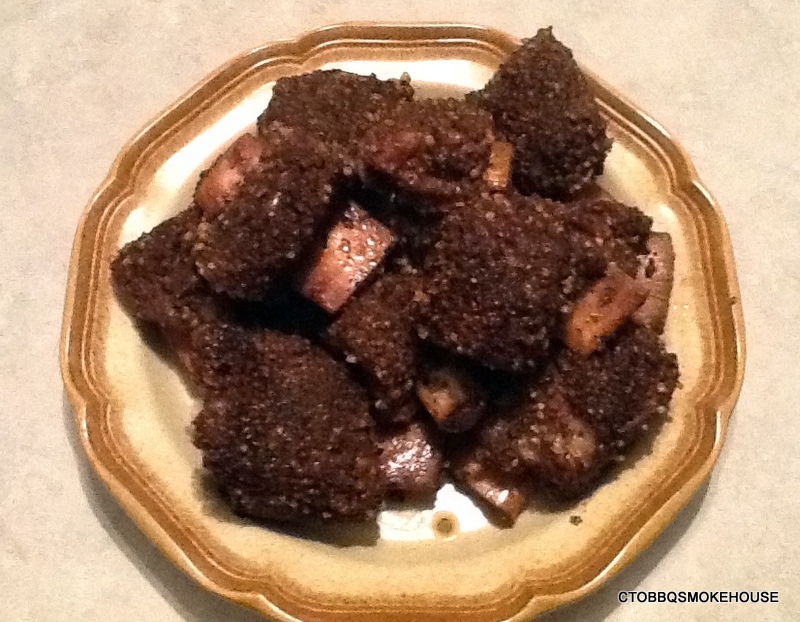 This entry was posted in Beef Short Ribs, Pastrami and tagged Barbecue, Pastrami, Short Ribs. 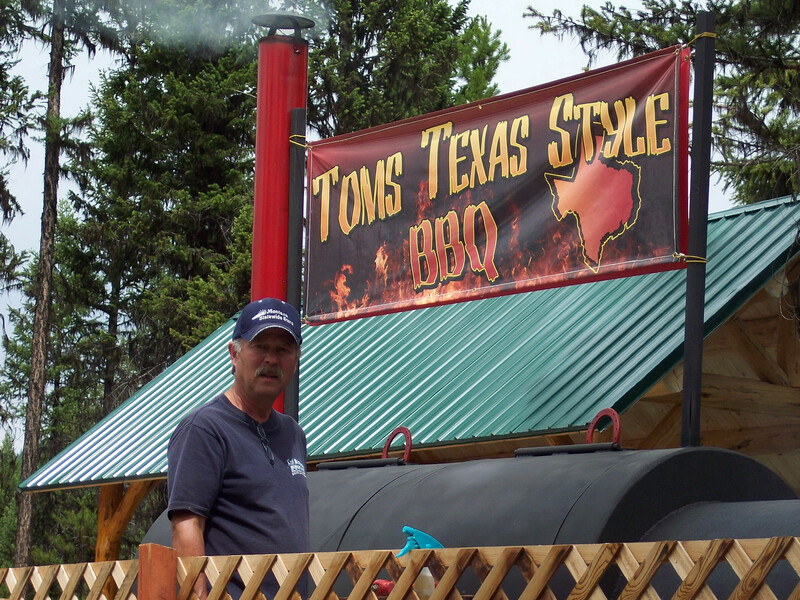 Turning your ordinary grilling into extraordinary Barbeque.